This dish is a great way to use garden-fresh eggplant. 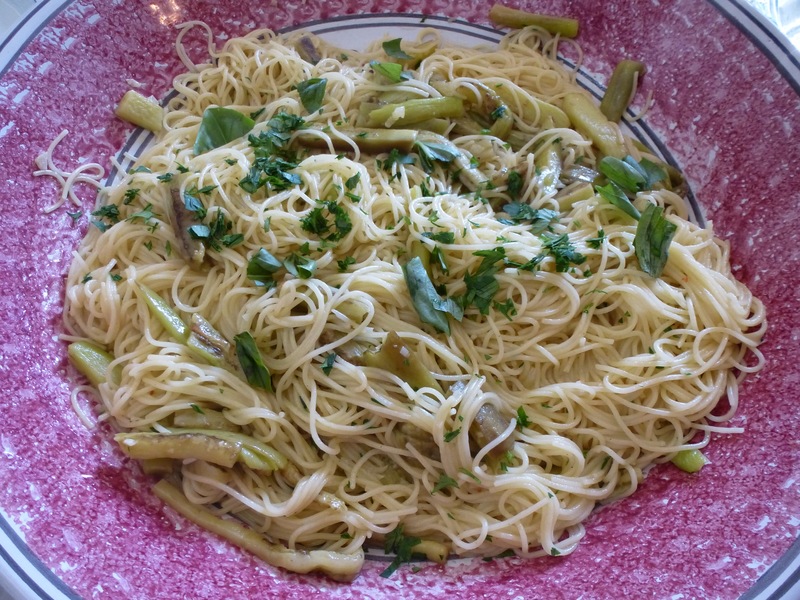 It is basically a pasta with garlic and olive oil combined with sautéed eggplant. It is simple but enhances the flavor of sweet eggplant. We grow Ichiban eggplant, a long Japanese variety, that seems more sweet and less seedy to me than some other varieties. It works particularly well in this recipe. Begin by bringing a large pot of water to the boil for the pasta. Add some salt once it boils. In a medium frying pan combine canola oil with 2 Tbsp. extra virgin olive oil. Turn heat to medium and, when hot, salt the epplant slices and place about 8 slices in the hot oil. Do not overcrowd the pan; you will probably need to do this in three batches. Sauté 3 minutes, then turn over and continue cooking for about 5 minutes until the eggplant begins to have some golden color. You want the eggplant to be just tender, not mushy. Remove eggplant to a paper towel-lined dish. Repeat, adding a bit more canola and olive oil until the eggplant is sautéed. Once the eggplant is all cooked, cut into bite size pieces and set aside. Boil the pasta after the eggplant has been sautéed, reserving 1/2 cup of the pasta water. While pasta is cooking place garlic in the same frying pan used to sauté eggplant. Add 1/2 cup extra virgin oil, then turn heat to medium low and sauté garlic until fragrant and soft but not brown. It should take about 2 minutes. Add Aleppo pepper, 1 Tbsp. parsley. Stir. Add cooked and drained pasta to the garlic oil. Season with salt and pepper to taste. Add pasta water to moisten. Pour into serving bowl. Toss in the sautéed eggplant. Garnish with remaining parsley and basil. Serves 4-5. This entry was posted in Pasta, Vegetables, Vegetarian. Bookmark the permalink.